Oceanside California resident, Chanelle Wright, gave an interview to a local television station this week, and she said that on Sunday, she and her neighbors found a turtle duct taped to balloons and stuck in the top of a eucalyptus tree. Since climbing the tree or getting a ladder seemed too much like work, they called the fire department to get it down. After all, that’s a perfectly reasonable use of a half-a-million-dollar truck and a trained crew of firefighters and paramedics. Luckily, gravity and wind solved the problem and a gentle breeze dislodged the turtle, and it floated down to earth uninjured. Now, Humane Society officials are searching for the alleged perpetrator, and Ms. Wright said she is not only horrified by the abuse but plans to adopt the turtle if no one claims it. You fools!!! Don’t you realize what this means? No one taped that turtle to those balloons. He did it himself. He obviously represents an evolutionary leap forward, and he could be the progenitor of a race of super-intelligent turtles that will eventually destroy us all. Humans didn’t make their first manned balloon flight until 1783. This turtle already matched that, and at this rate of accelerated development could have weapons of mass destruction in a matter of months. 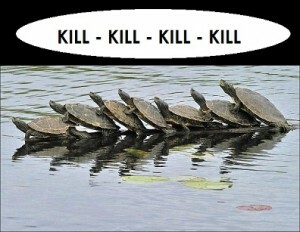 We must strike hard and fast and destroy every turtle in a three-hundred-mile radius of Oceanside immediately. After all, we already have more evidence against them than we had against Iraq.